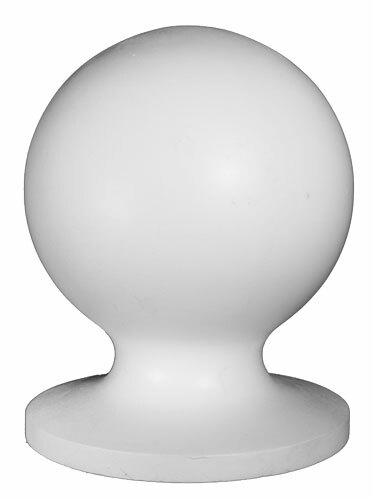 Add some beauty to your porch balustrade with an ornate polyurethane ball top finial. High Density Polyurethane Ball top Finial. Attach with a Polyurethane adhesive such as PL Premium or Gorilla Glue. Some installers may choose to use a dowel screw (double ended lag screw), but it is not necessary. Poly caps and finials work well with either Poly or Wood Newel Posts. Our “poly” products are made from environmentally friendly water-based High Density Polyurethane (also called urethane, HDP, or simply Poly). The material is similar in density to a softwood such as white pine. Unlike PVC or Vinyl, our Poly material looks and feels like authentic wood. Each pattern is made to exacting dimensions by our staff of Master Patternmakers. The edges of Western Spindle Poly Products are sharp, clean, and offer the true authentic look and feel of wood. It comes factory primed with a high emulsion latex paint that can be finish coated with any high quality exterior latex paint. Polyurethane spindles are reinforced with an internal PVC pipe for strength and rigitity. The rails are reinforced with either a PVC or Aluminum pipe. Cut our Poly spindles and PVC-reinforced rails using normal woodworking techniques. For rails with an internal aluminum pipe, a slow speed cutoff saw, a.k.a. multi-cutter, works best. WHAT ARE THE BENEFITS OF USING POLY? While many of our customers prefer the authenticity of wood, there is no question that urethane products have a few advantages. Urethane is very low maintenance. The paint is chemically bonded during the molding process which prevents cracking and peeling. An additional primer is applied before shipping all orders. Urethane will not take on moisture, which allows it to withstand the environmental elements. It will not rot and is impervious to insects. Urethane simulates wood, is structurally sound and is the perfect enhancement for any of your building or remodeling projects. All Western Spindle Poly products are made here in the USA. How do I install these finials? Attach with a Polyurethane adhesive such as PL Premium or Gorilla Glue. Some installers may choose to use a dowel screw (double ended lag screw), but it is not necessary.